Helpful reminder for email attachments. Is there a better alternative to ForgetMeNot? Is ForgetMeNot really the best app in Email category? Will ForgetMeNot work good on macOS 10.13.4? Note: ForgetMeNot is no longer for sale. Its functionality is now included in Feigeist's MailButler, whose link can be found int he following paragraph. ForgetMeNot--which is now a part of MailButler, the complete assistant for Apple Mail--is a helpful reminder app, designed to help you avoid leaving attachments off of emails. Probably everybody has had this feeling before: You just clicked on "Send" in your favorite email client and immediately after realized that you mentioned an attachment in your email text, but forgot about attaching the described file to the email. What do you do now? You send another email with the files attached and something like: "Here are the attachments - finally." 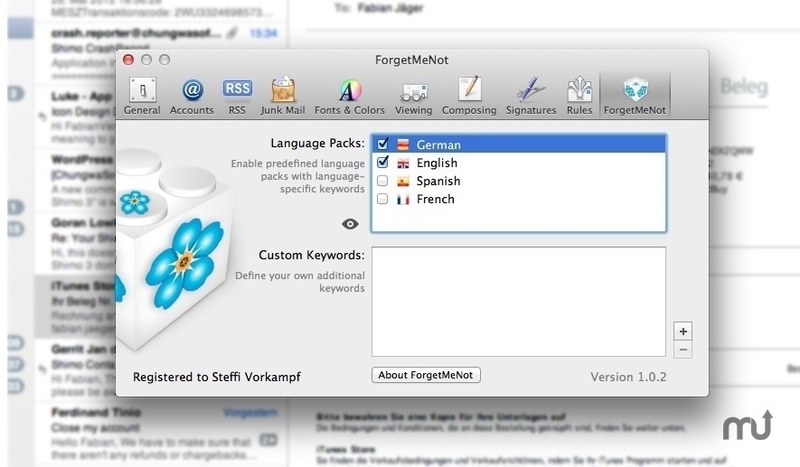 Forget about these embarrassing emails from now: Install ForgetMeNot and never forget about attaching files again! ForgetMeNot scans your email text for special keywords referring to attached files and reminds you if it cannot find an attachment when you try to send your email. It comes with predefined keywords for some languages, but you can easily add more custom keywords to make ForgetMeNot work even more reliably.